KIEV, Ukraine -- Unclear whether former British PM will take up offer by Petro Poroshenko, as Blair meets other key figures in Kiev hosted by oligarch Viktor Pinchuk. Ukrainian president Petro Poroshenko with Tony Blair in Kiev. Tony Blair has been offered a role advising Ukraine’s president after the pair met in Kiev on Wednesday. Blair, whose foundation has long-standing links with a Ukrainian oligarch, is said to be considering the role. “You are now facing great challenges in the spheres of security and reforms,” Blair told Petro Poroshenko, according to the Ukrainian presidential website. 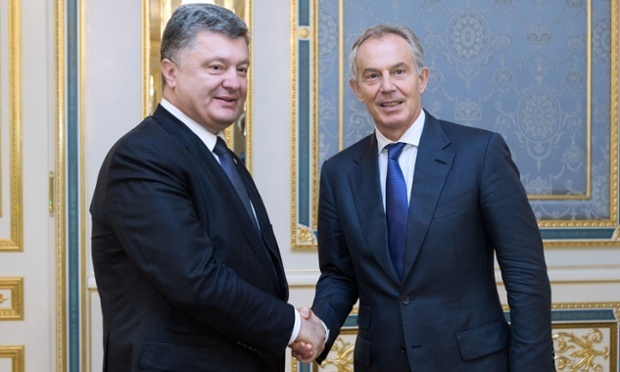 Poroshenko called Blair a “true friend of Ukraine” and offered him an advisory role. A source close to Blair declined to comment, and it is unclear whether Blair has accepted the role. It is understood that Blair would not be paid. The former British prime minister attended a private dinner on Wednesday night in Kiev hosted by Ukrainian oligarch Viktor Pinchuk and attended by other Ukrainian business and political figures, in which he was briefed on the current situation in the country and asked how he could help. Blair has spoken a number of times at an annual summit hosted by Pinchuk in the Crimean resort of Yalta. He was the dinner speaker at the most recent event, hosted last September in Kiev because Crimea had been annexed by Russia. Pinchuk’s foundation paid $500,000 to Blair’s Faith Foundation in 2011 and 2012, $230,000 in 2013 and $330,000 in 2014 and a spokesperson for Pinchuk confirmed there is a long-term relationship between the two. Pinchuk has hosted several visits by the former prime minister to Ukraine. It would not be the first time Blair has advised the government of a post-Soviet state. While billionaire chocolate magnate Poroshenko says he wants advice on driving through difficult reforms, Blair has been criticised in the past for cosying up to authoritarian governments in the region. As part of his advisory role to Kazakhstan’s president, Nursultan Nazarbayev, Blair counselled the authoritarian ruler on how to handle criticism over the massacre of oil workers by riot police in 2011. Blair told Nazarbayev in a letter that the deaths, “tragic though they were, should not obscure the enormous progress that Kazakhstan has made”. Poroshenko has appointed a number of foreign officials to key roles in his government, most notably naming former Georgian president Mikheil Saakashvili as governor of Odessa last month. Saakashvili is known for the reforms he carried out in Georgia, but is also a controversial figure despised in Russia and wanted on criminal charges in Georgia. He claims the charges against him are politicised. Saakashvili also sits on Ukraine’s International Advisory Council for Reforms, the body which Blair has been asked to join, along with former Swedish foreign minister Carl Bildt. US senator John McCain turned down a role with the body, citing US Congress regulations.